Scandal Recap: "Everything's Coming Up Mellie"
Season 3 of Scandal is shaping up to be the Season of Mellie! While Bellamy Young’s character was once only an obstacle to Fitz (Tony Goldwyn) and Olivia’s (Kerry Washington) happiness, she’s become so much more. Tonight’s Scandal was a kind of origin story of sorts, which showed how Mellie became the frigid, political animal she is today. Flashbacks showed what it was like when Fitz was first contemplating running for office, 15 years ago. He and Mellie were newlyweds in love, hoping to conceive. She wanted to help her husband, but Jerry wanted nothing more than to antagonize his son. Later, Mellie went to Jerry to try and make peace. He was drunk, and revealed the reason Fitz didn’t want to run on his military service was because he’d been ordered to shoot down a passenger plane as a matter of national security. Instead of going public and pressing charges, Mellie stayed quiet and forced Jerry to start being nice to Fitz. 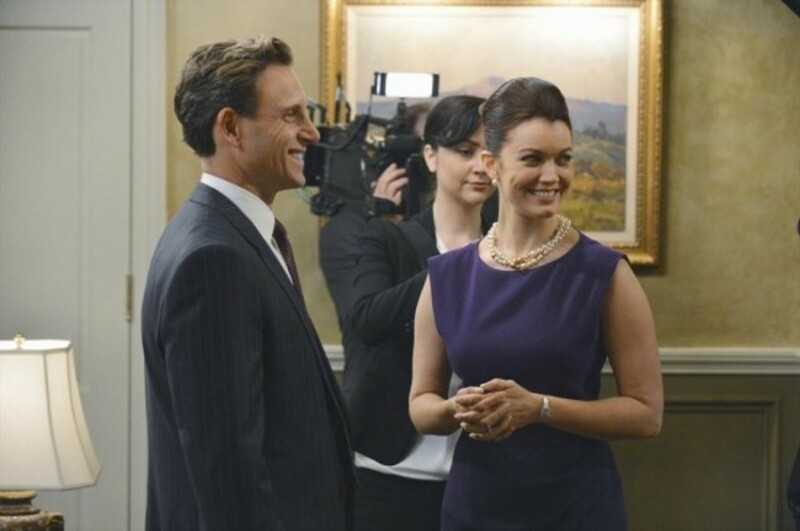 A short time later, Mellie told an ecstatic Fitz she was pregnant. Mellie seemed uncertain if her son might actually be her husband&apos;s half-brother. Personally, this trope felt unnecessary. We already knew Jerry was a bad guy, and Mellie’s sacrificed a lot for Fitz’s career. It does add a whole new tragic angle to Fitz’s and Mellie’s relationship, however, and it explains a lot. 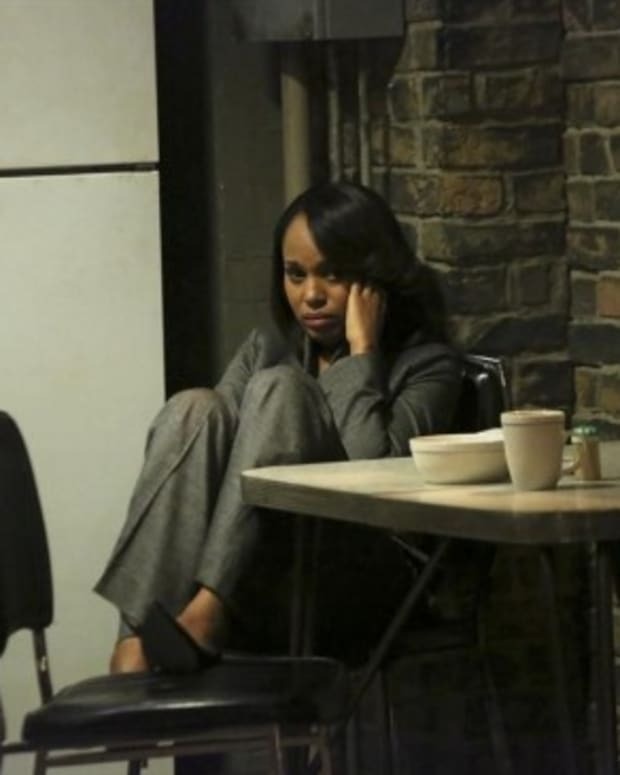 Mellie never told Fitz what happened. 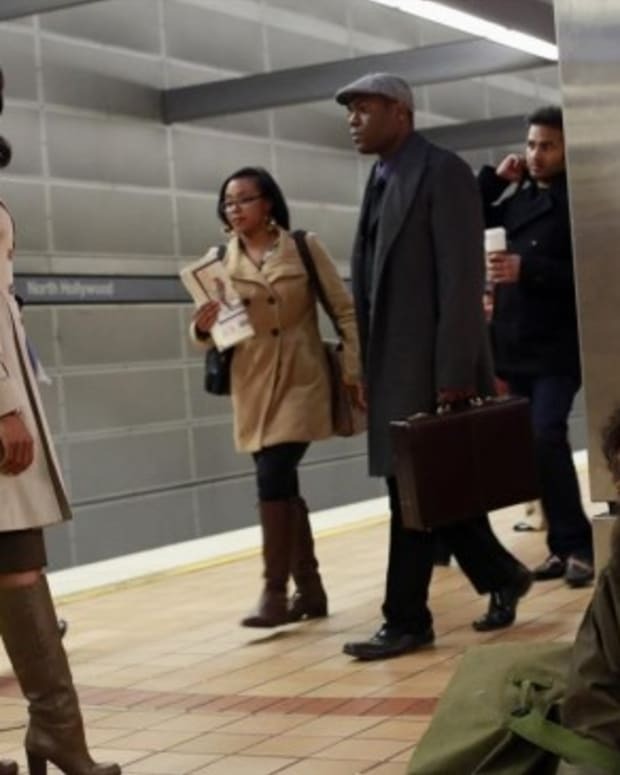 However unconscious, it’s clear she resents her husband for what happened to her. It probably doesn’t help that Fitz acts a lot like his father, especially when he drinks. With the paternity of Little Jerry now questioned, might we finally see the Grant’s firstborn son? The reason Fitz had to shoot down Flight 522 was because there was a dirty bomb on board. It was going to be used to possibly start WWIII. Olivia and her associates continued to investigate. They discovered there was a passenger removed from the plane right before it took off. His name was Omar Dresdan and his family believed he died in the crash. They searched for witnesses and found an airport staff member who could provide evidence. 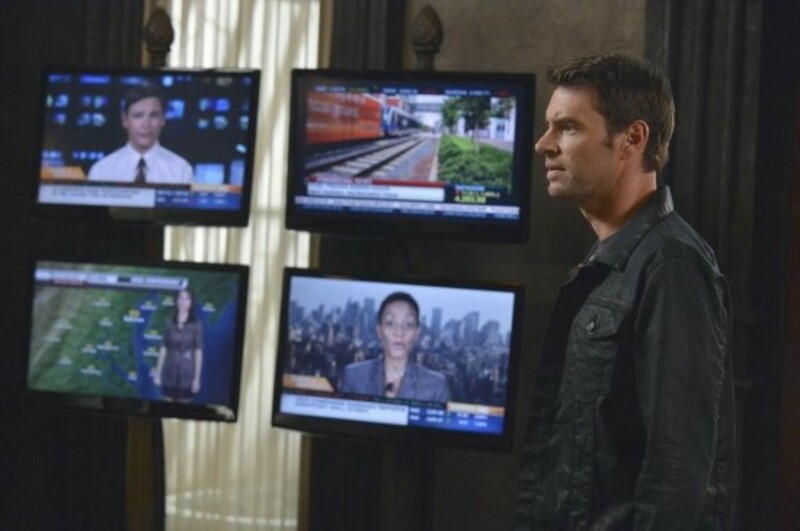 Before Jake (Scott Foley) could question the man, he was murdered…by Quinn (Katie Lowes)! Quinn needs to stop playing spy, because she is terrible at it. Anyone would know there’d be security cams, even if she was just drugging the guy, what was she thinking? She also wanted credit for discovering how evil Eli was because she noticed Olivia didn’t get along with her dad. Quinn needs to have a seat! Eli (Joe Morton) went to visit Omar Dresdan, who was in a heavily-guarded prison cell somewhere. However, it turned out Omar was Olivia’s mom, Maya Lewis (Khandi Alexander)! Cyrus (Jeff Perry) and Mellie plotted to knock Sally (Kate Burton) down, by exposing her husband’s philandering. When she’s out of town on business they throw a charming prostitute at him, but he didn’t bite. As they wondered what his type was, they saw Daniel (Jack Coleman) flirting with James! Cyrus better watch how he plays this though, because currently James is very unhappy with his hubby. Also, it looked like Sally knows her husband’s secret. * Cyrus used to be married to a woman. Man, do I hope we get to see his wife down the line! *James got fired from his job when the Grants sat down for an interview with another reporter. *Olivia still wanted (almost) nothing to do with Fitz. He finally found out Rowan/Eli was her dad and secretly made sure she had a security detail, anyway. * There was a government cover up about Flight 522, and Jerry was a part of it. * It was great seeing Fitz step up and defend Mellie over his cheating scandal. She seemed very touched by his sincerity. *James has awful taste in bowties. 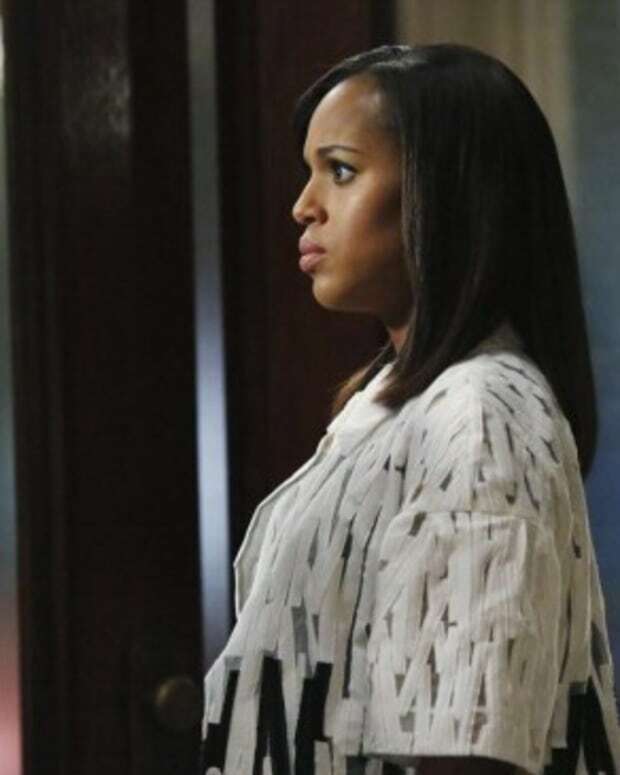 Scandal Recap: "Guess Who's Coming to Dinner"